It’s getting late and I’m lost in the winding lanes of medieval Toledo. Normally I wouldn’t mind — it’s one of my favorite cities in the world to be lost in — but I’m due back at the hotel shortly, and first I have to find an address I haven’t looked for in more than a decade. Somewhere in this warren of weathered doors and dusty stones is my favorite place to buy Andalusian marzipan. Apparently God likes the idea very much, as dozens of shop windows all over the city proudly display a wild assortment of beautifully arranged marzipan sweets. But there’s one purveyor of marzipan in particular I’m trying to find. Finally, I turn a corner and find it: a tiny sign declaring the Convent of San Clement. I ring the bell, I’m buzzed in, and I climb the tile-clad stairs to a small landing. 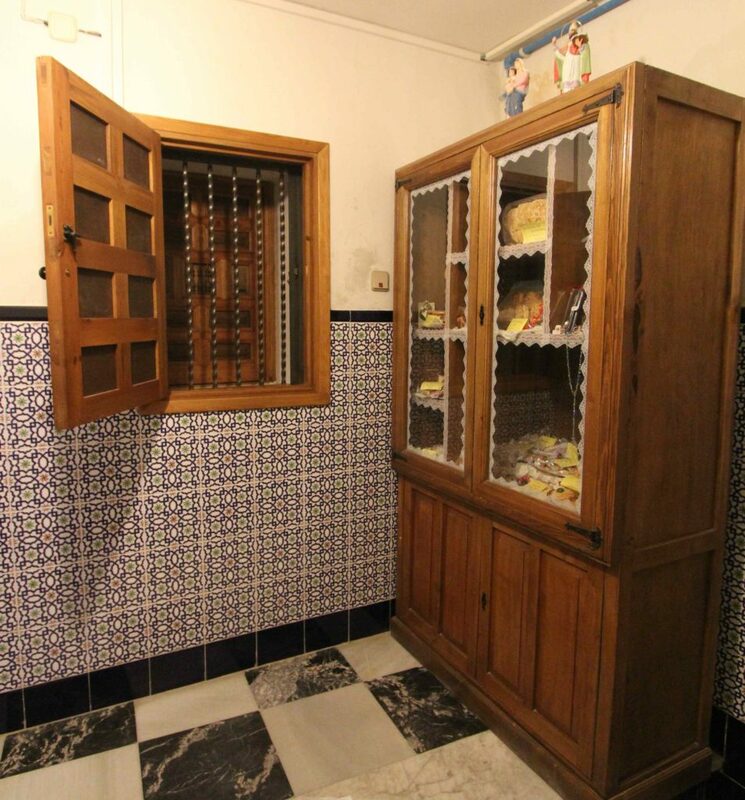 In a corner sits a glass display case containing a variety of delicately shaped pieces of marzipan, each with a card denoting its particular flavor. 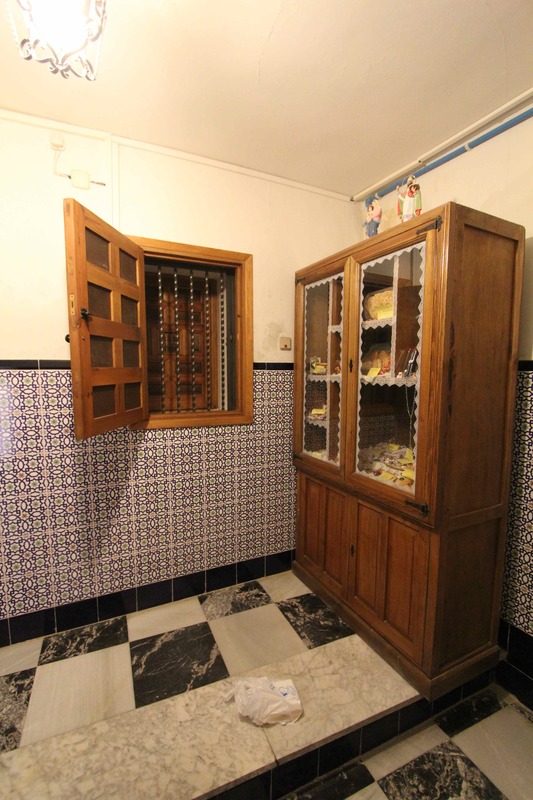 To the left of the case is a small window with a wooden door. I open the small door to reveal the iron bars that ensure my contact with the nun on the other side of the wall is minimal. The door on the other side swings open and the sister asks me what I would like. I point to the flavor I want, she nods, hands me the hand-made treats, accepts my money and we close our respective doors, the odd transaction completed. Back on the street, I can’t wait; I open the box and extract one of the little candies. It’s soft, the color of wheat bread, with a dark brown kiss of singed butter on the top. I hold it to my nose and breathe in the fragrance of orange flowers. Three main ingredients — almonds, sugar, orange-flower water — all mixed together to form one sublime delicacy. Three different faiths — Muslim, Jewish and Christian — came together a millennia ago to form a single culture in Toledo, and this modest, simple candy in the palm of my hand serves as both parable and cautionary tale; it’s beautiful, sweet, yet fragile and perishable. Standing in the cool shadows outside the convent where it was baked, I let the delight of three faiths dissolve on my tongue, and ponder the golden age of tolerance that produced it. 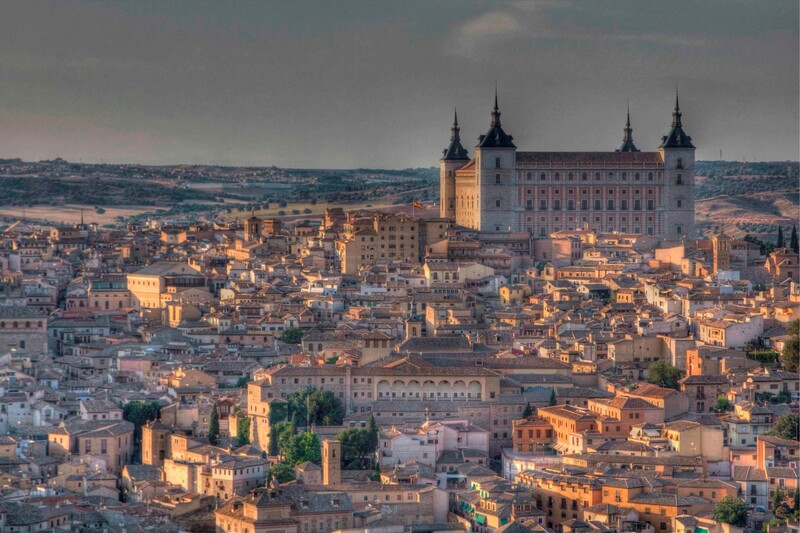 I first visited Toledo many years ago when my ambition was to see every city in Europe, and then run to the next. I’ve since learned my lesson. You cannot “do” Toledo in one visit. This ancient city is not so easily crossed off your bucket list. Which Toledo would you like to see? The artistic city of El Greco, still home to many of his works and yet offering the same views that inspired him to stay? 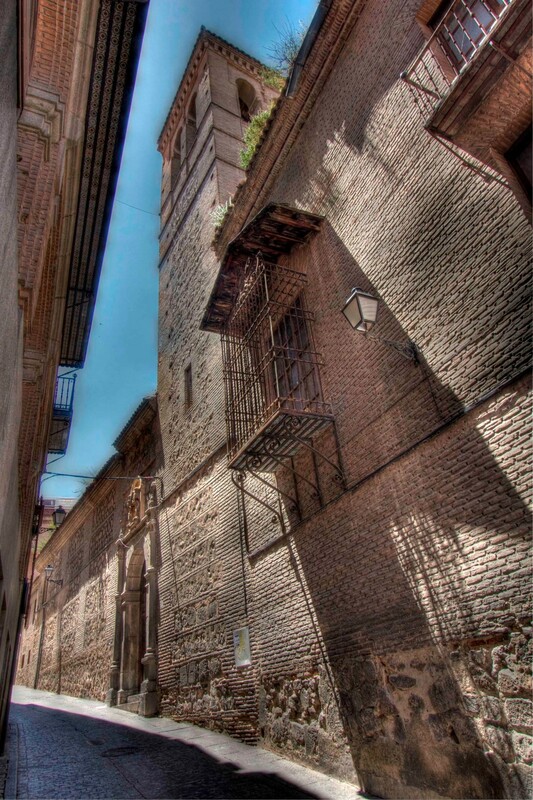 The tragic saga of the Spanish Civil War written in the violent Braille of bullet holes on the walls of the Alcazar? The Toledo of artisanal craftsmen bristling with works in steel and Damascene? There is always, it seems, another Toledo to be discovered. 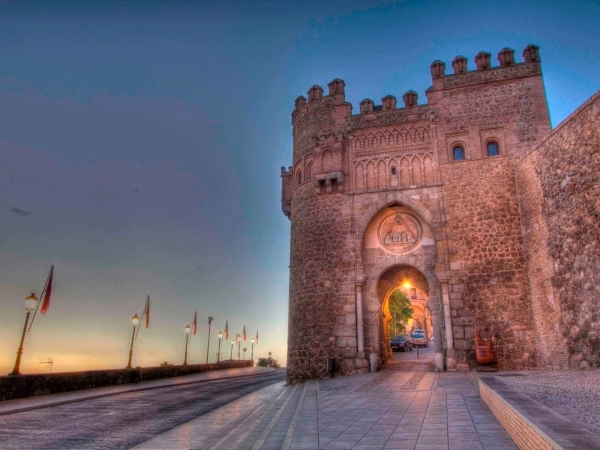 This time, I am looking for the Toledo that was one of the leading intellectual and cultural lights of the 10th century when most of Europe east of the Pyrenees was still mired in the Dark Ages. Walking the winding streets, I feel a renewed appreciation for this cultural crossroads, the entirety of which is listed as a UNESCO World Heritage Site. The layers of history here are seemingly endless, and they continue to produce intriguing surprises, even now. 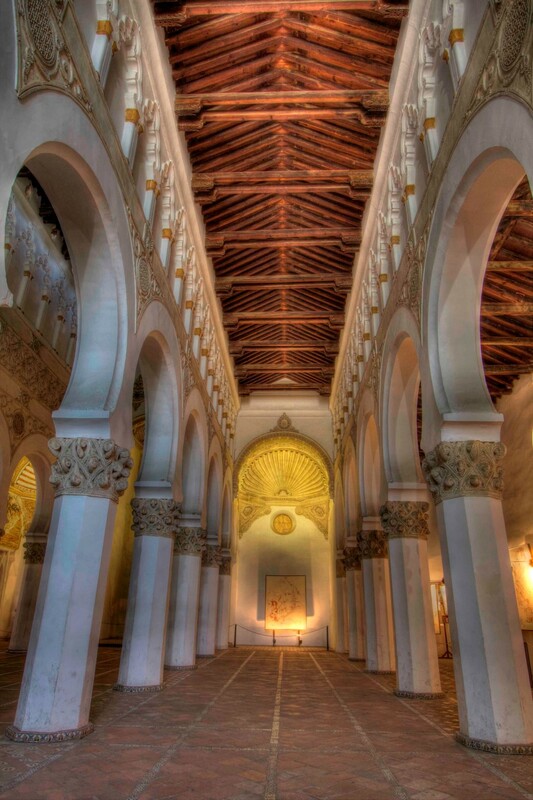 Just up the hill from the recommended Hotel Abad lies a glorious illustration of that idea, the 1,000-year-old mosque Mezquita Cristo de la Luz, constructed at the height of the golden age of tolerance called la convivencia. 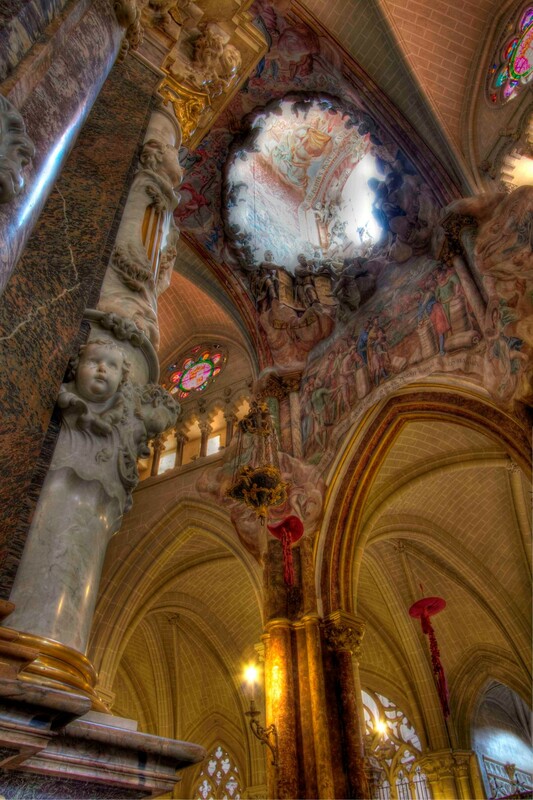 Less than a century later, it was converted into a church when Alfonso VI captured Toledo. There are still remnants of Romanesque frescos on the walls of the presbytery. 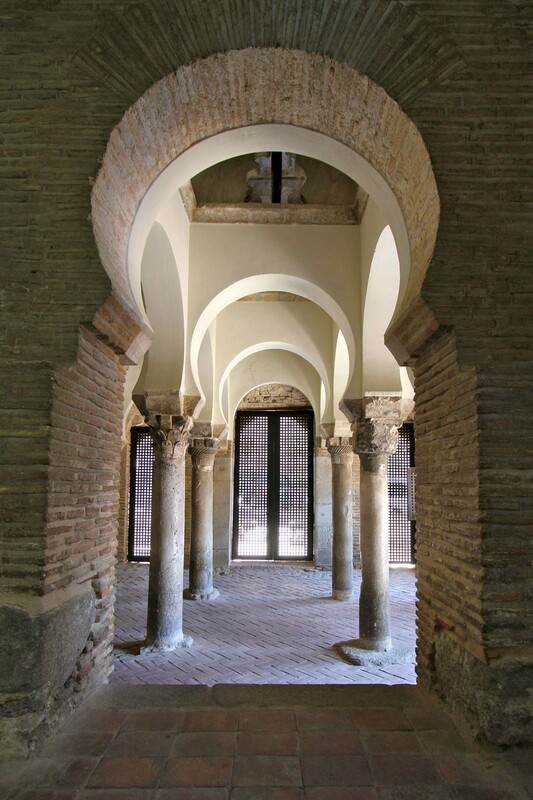 An apse was added in the middle ages and the new part of the structure adapted the design of the original building, and is the earliest example of the Mudéjar style of architecture in Toledo. 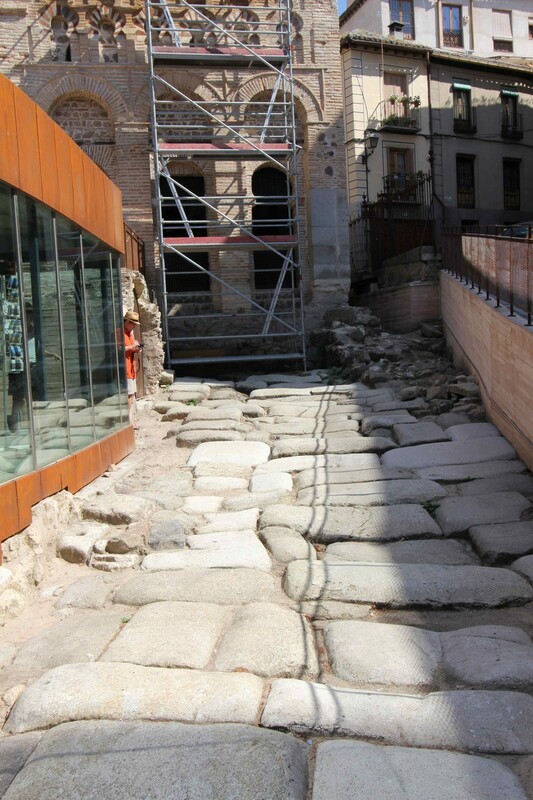 In 2006, it was discovered that when the mosque was first erected in 999 A.D., it was built hallway across an earlier Roman road, and they have begun to excavate the site, revealing the large, flat paving stones typical of Roman road construction. Standing on the bridge that crosses the excavation, you can behold at a glance a cross-section of more than 2,000 years of architectural history. It’s a view that wasn’t possible the last time I visited, further evidence that Toledo has an inexhaustible capacity to surprise the visitor. More surprises await; beneath the Medieval apse, a second, much larger structure has recently been discovered that dates as far back as Roman times. 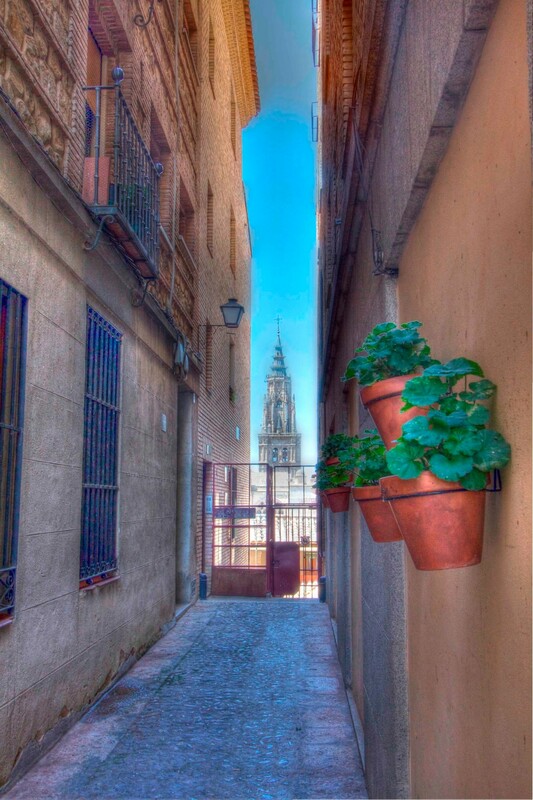 From the mosque I head uphill to find the oldest synagogue in Toledo, now known as Saint Mary of the White. 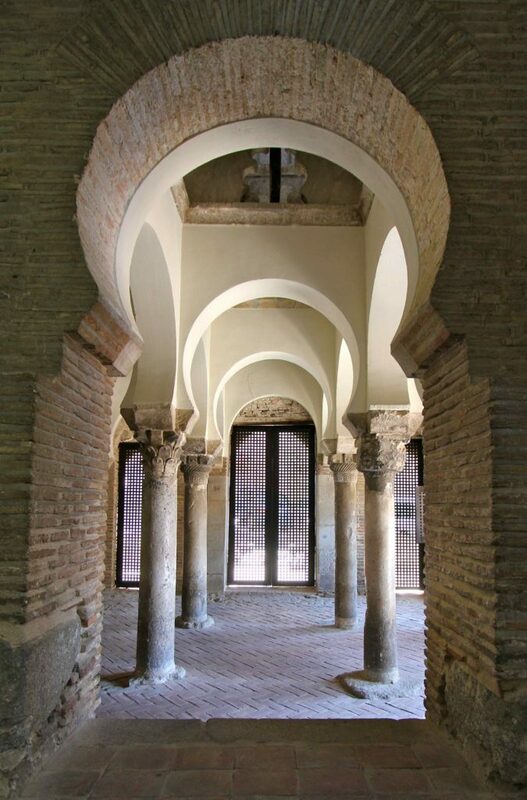 The door of Santa María la Blanca looks plain from a distance, but get closer and you can see the intricate geometric pattern of its Mudéjar construction. 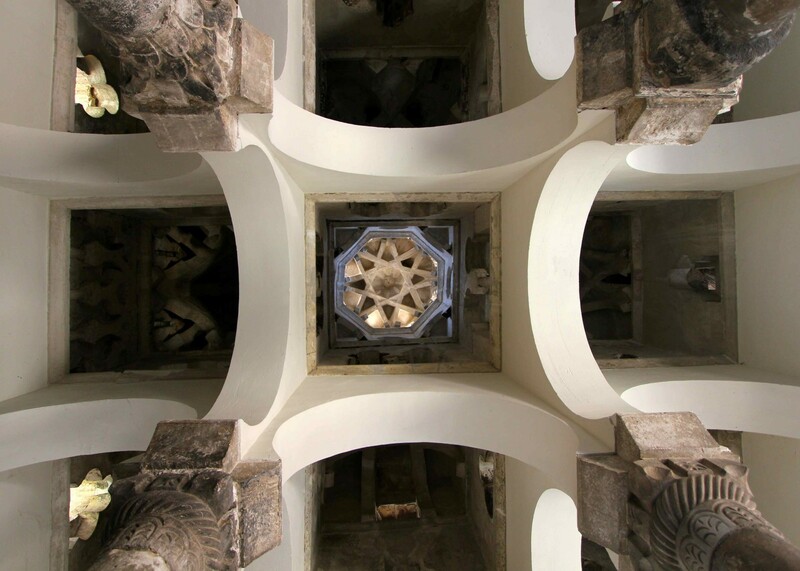 While it now bears the name of a Christian church — the Catholic Church converted it after the forced expulsion of the Jews in 1492 — it is notable for having been built under Christian rule by Islamic architects for Jewish worshipers, symbolic of a level of interfaith cooperation that scarcely seems possible today. The design again draws from a variety of ages and cultures, the capitals of the whitewashed horseshoe arches decorated with exquisite carvings of pine cones, palms, and flowering vines. But for all that, it is still not the most magnificent house of worship in Toledo. 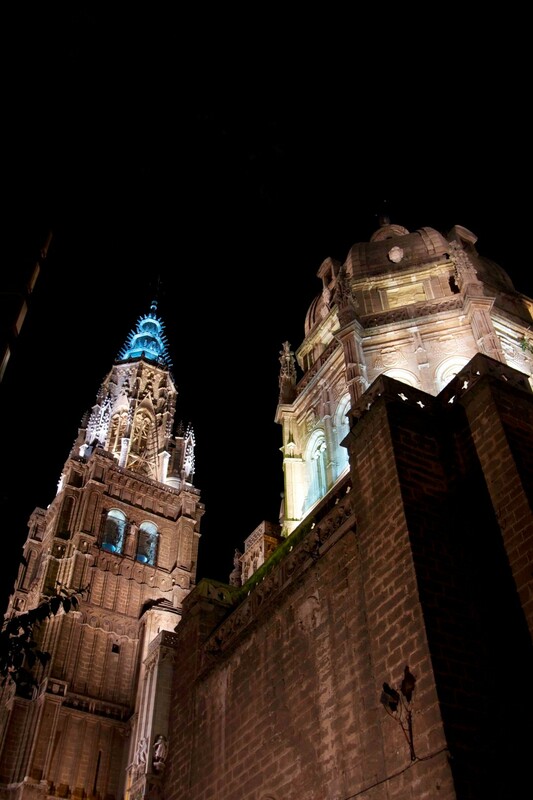 Toledo’s cathedral is the greatest example of Gothic architecture in Spain, and took more than 250 years to complete. It never fails to evoke a feeling of stunned wonder in me, exactly as it was designed to do. 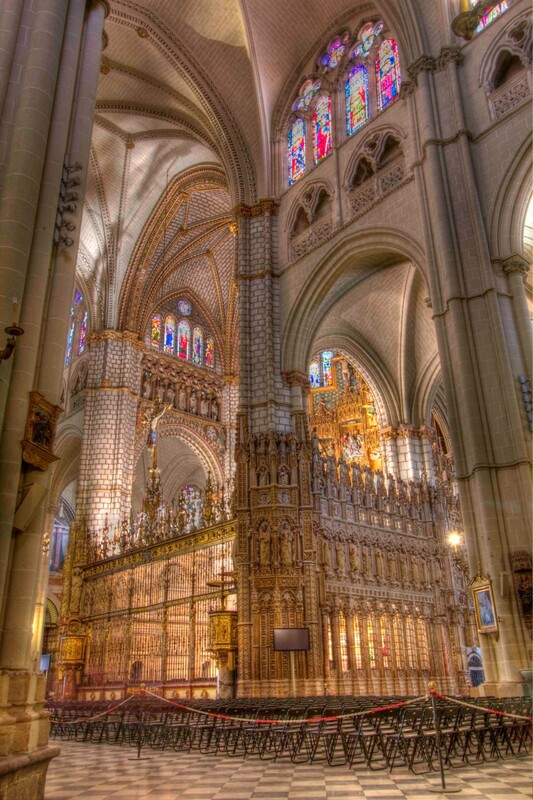 Its elaborately carved choir stalls tell the story of the Christian conquest of Spain over the Muslims that held the area for 700 years. It’s a beautiful illustration of both the woodworker’s art and the idea that history is written by the victors. If you really want to appreciate the grandeur of the cathedral, plan to arrive early or late, as tourists arrive in force at mid-day. Don’t try to see everything, you’ll be there all week, but make the time to linger awhile underneath the oculus, a skylight framed by an astonishing hybrid of paint and sculpture that floods light down on the Baroque altarpiece El Transparente. And be sure not to miss the stunning collection of masterpieces on view in the cathedral’s sacristy. Here you’ll find masterworks by El Greco, Rubens, van Dyck, Goya and others, all the more enjoyable for being in such an unexpected place. Emerging from the cool darkness of the cathedral, I pass workers placing wreaths of thyme, rosemary and lavender around the entrance to the church. I’m visiting on the eve of the festival of Corpus Christi and garlands of these sweet-smelling herbs and roses are strewn all along the path that the 16th century monstrance will follow the next day. Pots of flowers, lanterns, and brightly colored ribbons are hung from storefronts, and vivid banners are draped from every balcony. The festival culminates when the faithful carry the 500-pound, silver-and-gold monstrance containing the Eucharist around the winding streets that encircle the cathedral. 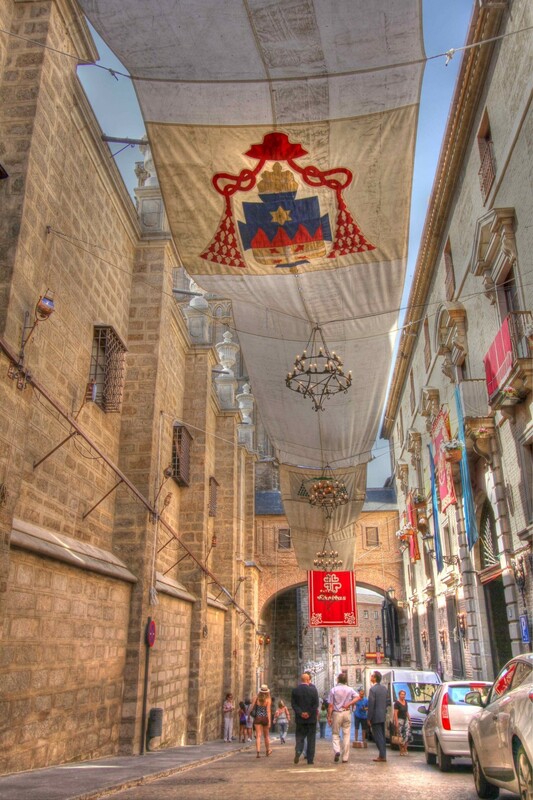 To ensure that the body of Christ is sheltered at all times, an unbroken length of canopy is hung high above the narrow street all along the path of the procession. It also provides some welcome shade from the heat of the day, and the locals half-jokingly say that they wish it would stay in place all summer. Which Toledo do you want to see? They are all here, melding together, piled high atop one another, waiting to be found. Focus your eyes a little differently and the perspective changes. 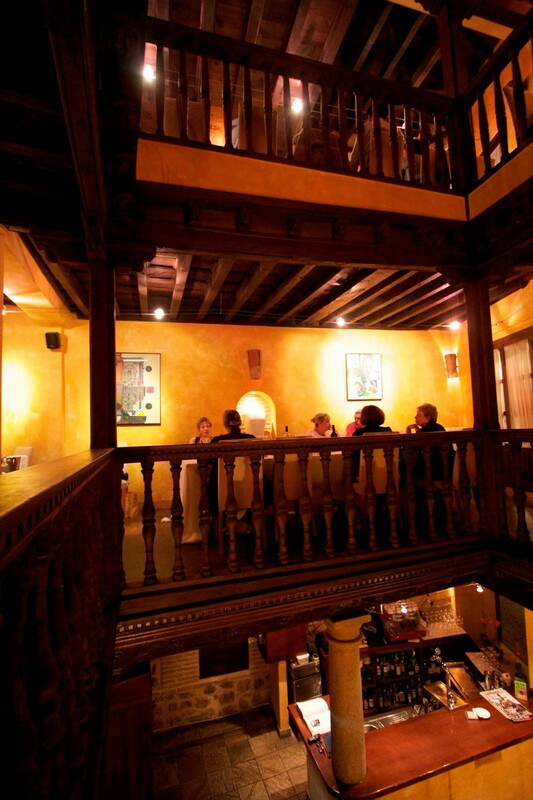 The Toledo I always come back to however, is the one made up of more secular pleasures. To sample just how rich those pleasures can be, go directly to Locum. 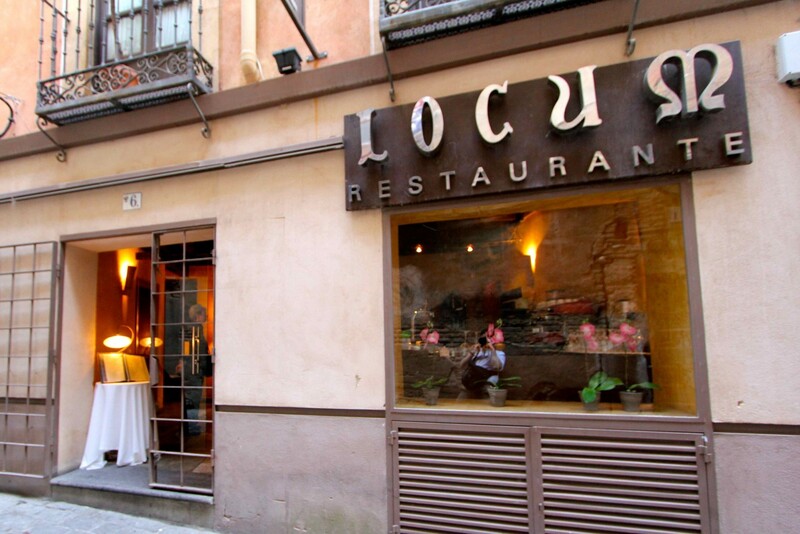 Though hidden away in a street behind the cathedral and easy to overlook, Locum is well worth seeking out. 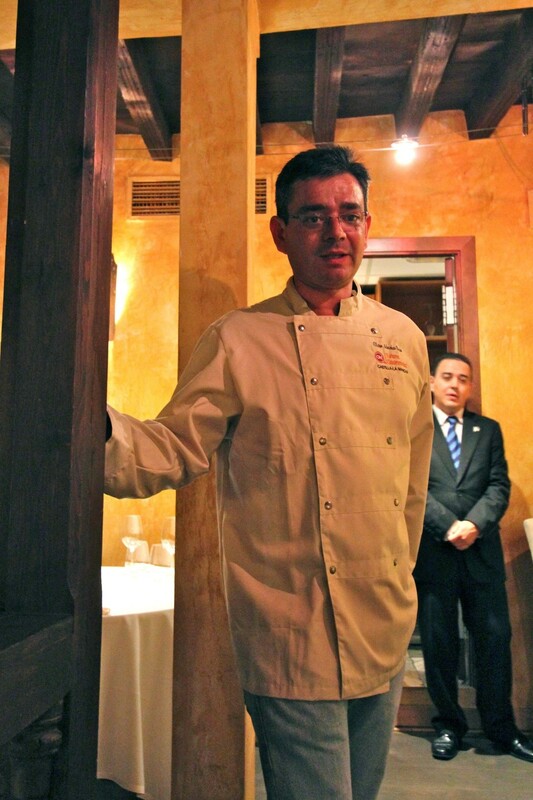 Chef Victor Sanchez-Beato, ably abetted by sommelier Eduardo Gallardo, served me the best meal I ever had in Toledo. 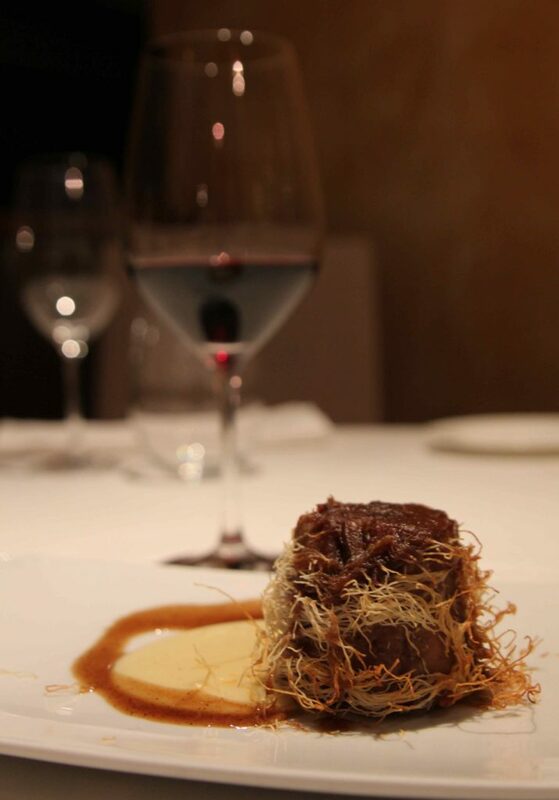 While Sanchez-Beato passionately embraces the culinary treasures of the region, he is no slave to tradition, and his imaginative dishes are nothing less than revelatory. And after a day of gobbling marzipan, I would have thought it would be the last thing I would want for dinner, but his desert of pastry filled with molten marzipan with manchego cheese blueberry ice cream had every diner at my table rocking back in their chairs in delight. 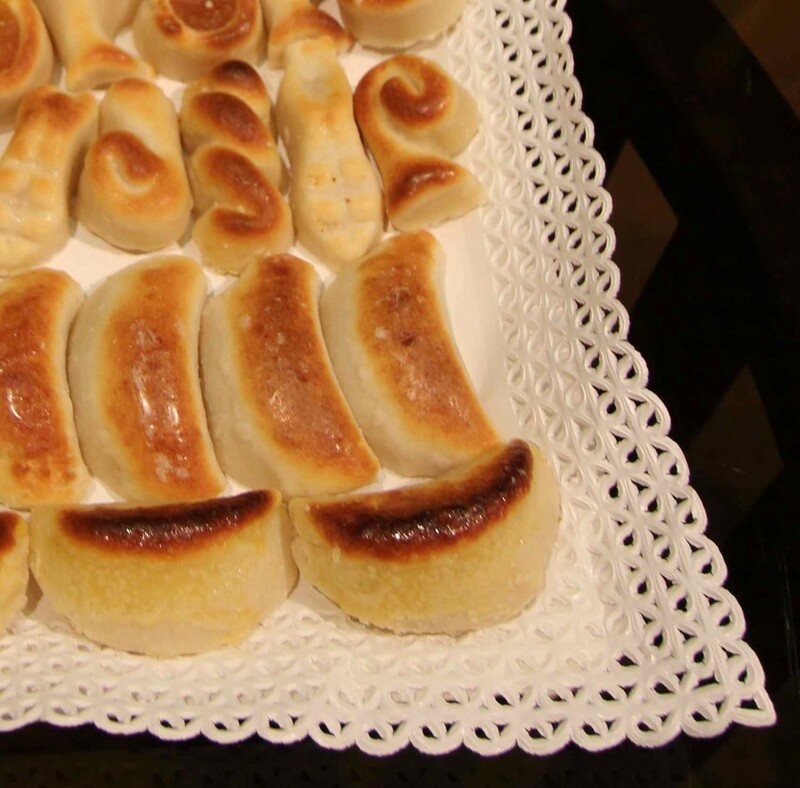 Note: Locum also offers a special Sephardic menu that features inventive interpretations of traditional Jewish meals, but they require a couple of days advance notice to do so. Call ahead. Blissed out on fine tempranillo and amazing food, I leave Locum and follow the sound of music through the streets ringing the cathedral. 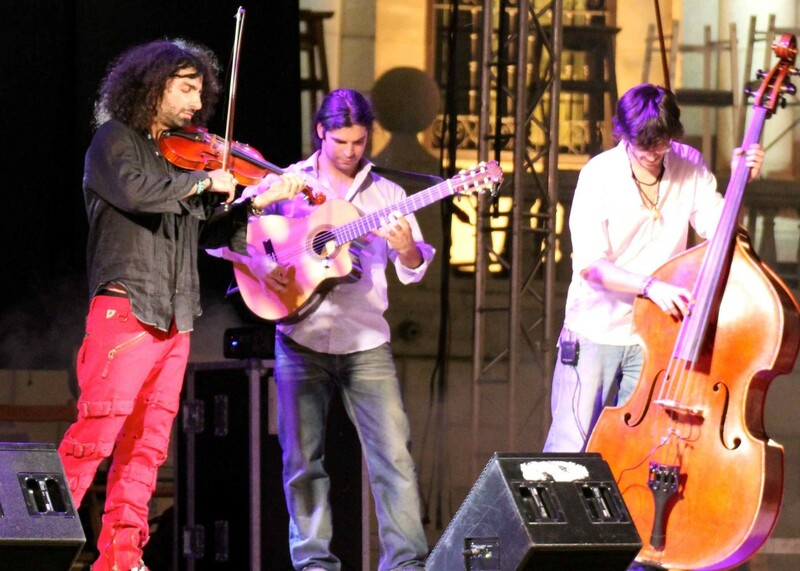 A spirited violin soars over the top of a small ensemble of musicians in a brightly lit square packed with listeners. The crowd is a diverse one, young and old, men and women, white and brown faces, all swaying together in a non-denominational congregation. The violinist is testifying through his instrument, giving the crowd everything he has, eyes tightly shut, his features focused in concentration and rapture. The musical litany recited here tonight has overtones of both Arab and Jewish cultures, yet it is one that everyone understands. Which Toledo do you want to see? For myself, for tonight, I choose this one. 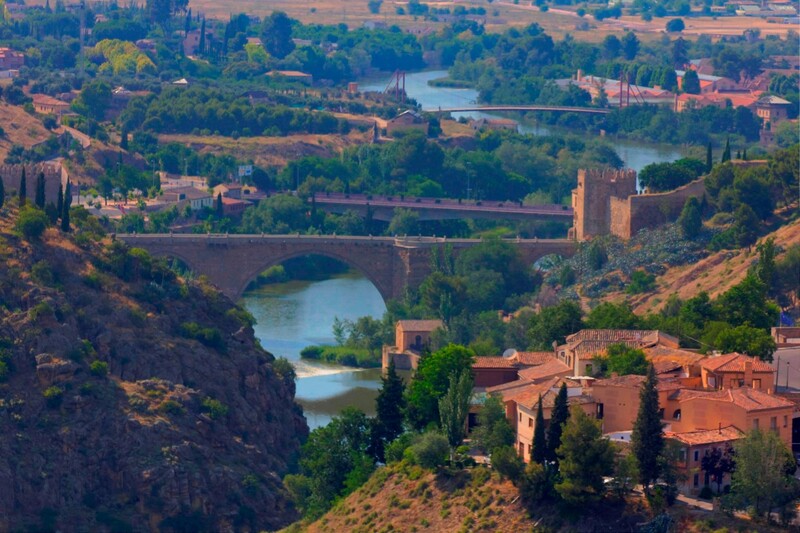 Toledo is a quick, one-hour hour drive down from Madrid’s Barajas airport. Buses travel frequently between the cities, and the AVE fast train cuts travel time down to half an hour, but Lukman Sea provides transfers for a far nicer and more convenient trip. TIP: Request Abdul as your driver. He speaks “four and a half” languages, is extremely knowledgeable, and is happy to answer your questions on the short drive down. 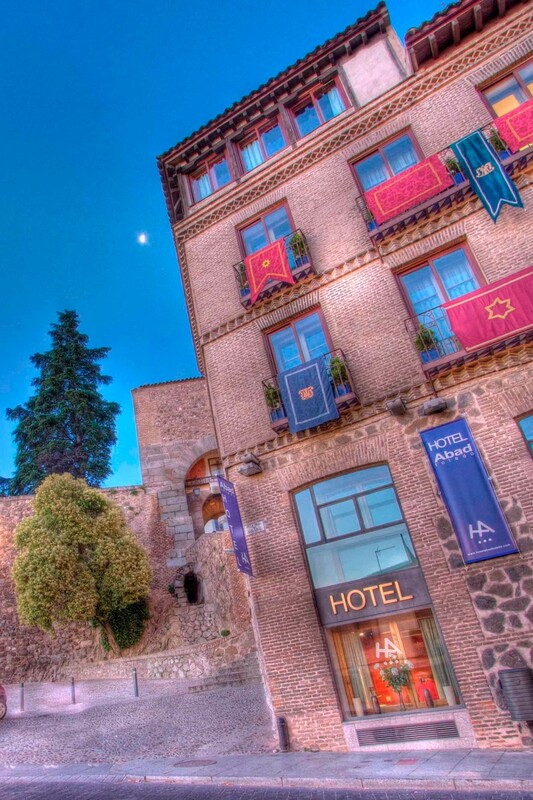 Stay at Hotel Abad, situated right across from the Puerto del Sol gate and short walk from Mezquita Cristo de la Luz. Offering the feel of a posh urban loft, Hotel Abad is a smart remodel of a historic building—it was once a blacksmith’s shop, but you’d certainly never know it—and is fitted out with every modern amenity. The rooms are quiet and the location couldn’t be better. Some rooms have grand views. They also do a lovely breakfast and offer an all-day coffee bar. Particularly if your time is short, consider hiring the services of a tour guide. Not only can they answer your questions and provide valuable insights and context for what you’re seeing, they sometimes have access to sites or areas that are not technically open to the public. The Visigothic Puerto del Sol gate at dawn. Long shadows transform the ancient buildings of Toledo into works of art that evolve throughout the day. Marzipan from Convent of San Clement. Excavation of the Roman road outside Mezquita Cristo de la Luz. 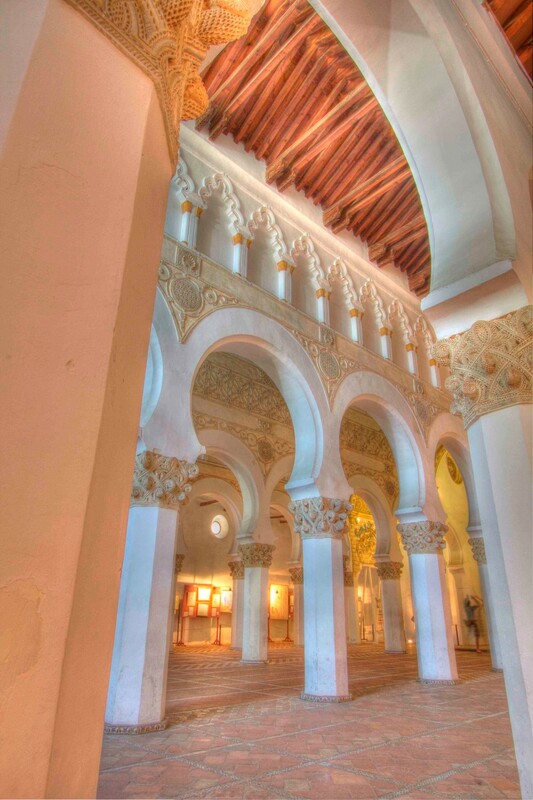 Interior of Mezquita Cristo de la Luz. The ceiling of Mezquita Cristo de la Luz. 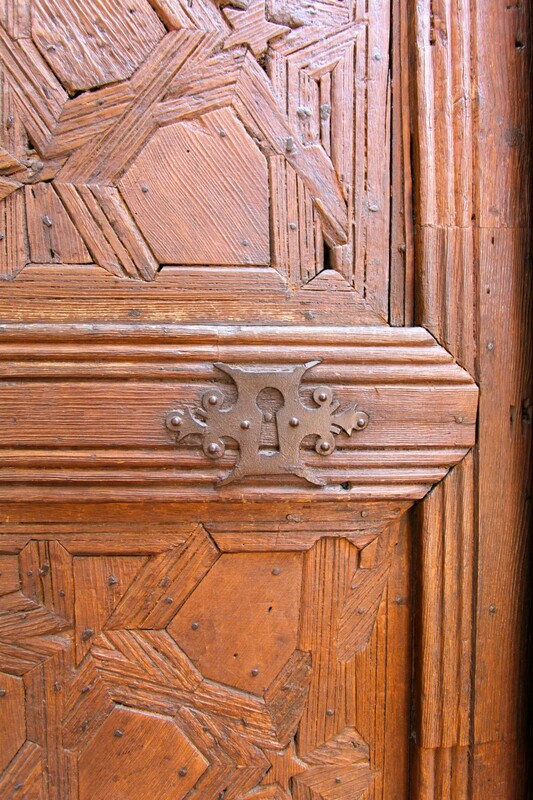 Synagogue door: the door of Santa María la Blanca reveals an intricate geometric pattern. The interior of Santa María la Blanca, the oldest intact Jewish synagogue in Europe. 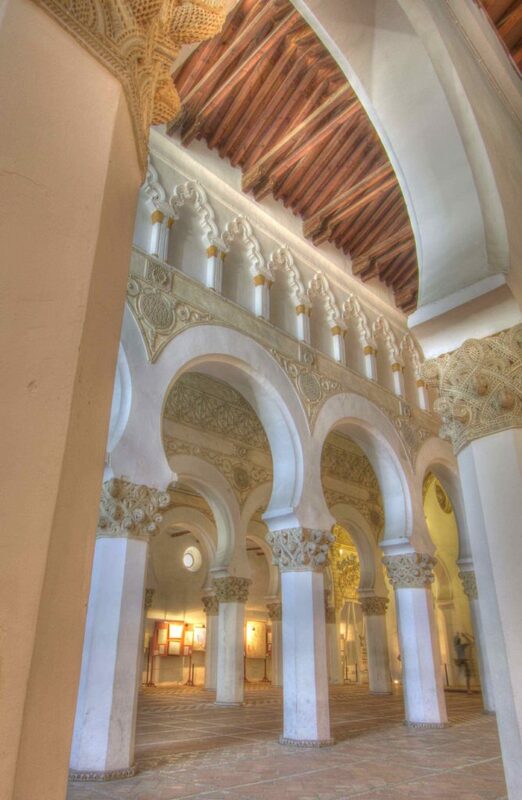 Another view of the interior of Santa María la Blanca in Toledo. Toledo’s cathedral is the greatest Gothic cathedral in Spain, and took more than 250 years to complete. The grand oculus in Toledo’s cathedral was added after construction was already underway. For the festival of Corpus Christi, the streets are hung with canvases to shade the path of the Eucharist as it makes its annual procession around Toledo's cathedral. 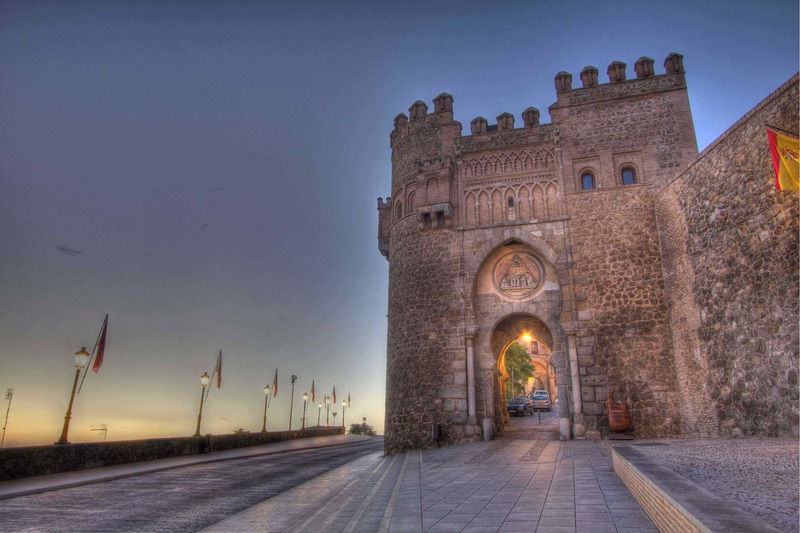 Toledo bridges: Bridges span the river Tagus that encircles Toledo on three sides. The entrance to Locum behind the cathedral. 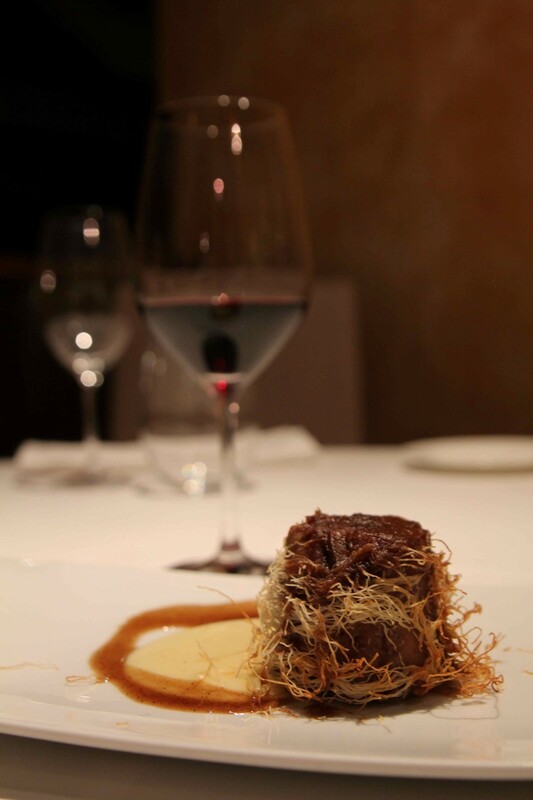 A contemporary twist on a Sephardic Lamb dish at Locum. Chef Victor Sanchez-Beato (foreground) and sommelier Eduardo Gallardo of Locum. A view of Toledo that El Greco would have recognized, from the gracious balcony of the Parador Toledo. 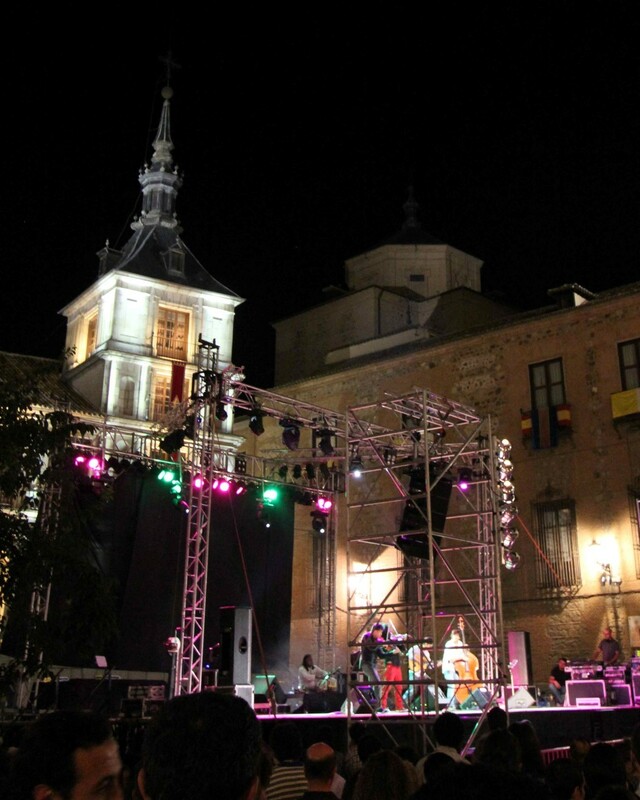 Festival musicians outside the cathedral on the eve of Corpus Christi. 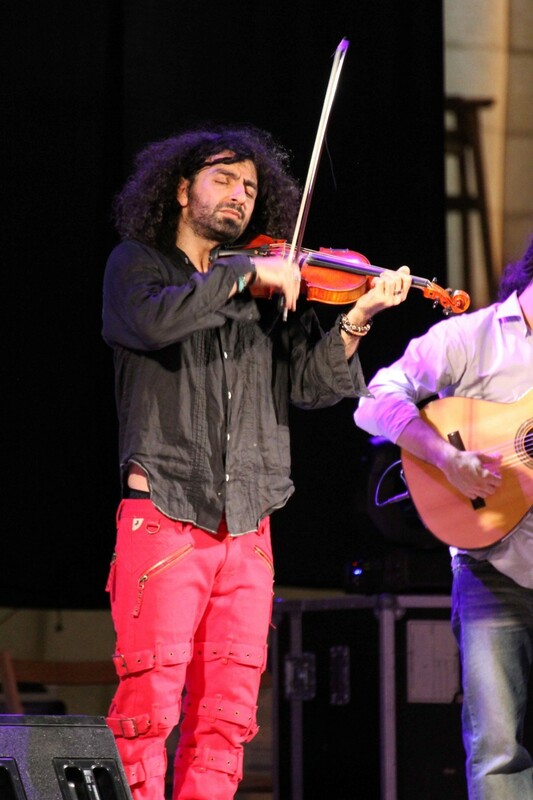 Soloist: Violinist Ara Malikian electrifies the crowd with his exhilarating blend of Arab, Gypsy, Flamenco, Jewish and Klezmer music. Robert Bundy has visited more than 300 cities and 32 countries in the last ten years and still gets a charge out of getting his passport stamped. He convenes The Travelers' Roundtable is part of Lake Effect with host Mitch Teich for WUWM 89.7 Public Radio Milwaukee.